Despite all of the press surrounding Windows Vista, the Redmond crew is pushing forward and moving the conversation officially (if ever so slightly) on to Windows 7. In a special interview with the Wall Street Journal tonight, Steve Ballmer and Bill Gates took the stage to retell stories of Microsoft's early days and give a super-early preview demo of Windows 7. Engadget provided the live-blogging of the event, so if you're interested in the play-by-play rundown of what happened, check them out. For this audience, I think the Windows 7 portion of the evening is of the greatest interest. Still, if we are to accept that Windows can drive future computing trends, here's what we have to look forward to in the Windows 7 era (still on target to ship "3 years from Vista general availability"- in other words, early 2010): heavy focus on alternative input techniques- multi-touch, voice, ink, et cetera. And sadly, that's about all we can glean from tonight's demo. 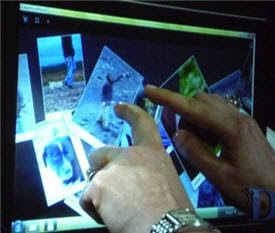 No talk of radically changing UIs (other than to accomodate aforementioned multi-touch). No talk of the once heralded WinFX file system. No talk of tighter "cloud integration." Does that mean those things aren't coming in Windows 7? Of course not! In fact, based on the demos, I think tonight's stunt was largely Microsoft's effort to make it clear to the world that they thought of multi-touch in the OS before Apple makes it even more pervasive than it is today in OS X. They're trying to stem the "you copied Apple" criticism that Vista suffered around the time of its launch. Will the stunt work? I guess we'll find out in about 18 months. For a better explanation of what Windows 7 will look like and why Microsoft is being more tight-lipped than usual about its development, check-out a post on the Windows Vista blog published today by Chris Flores. In short, despite tonight's public stunt, Microsoft still isn't ready to publicly talk about Windows 7- at least not beyond its support for new input techniques. Looks interesting but as you rightly said, not much for developers. Yeah, I think PDC 2008 is going to be the place to be for developers interested in Windows 7. I expect it will be to Windows 7 what PDC03 was to Vista. Let's just hope it's not quite the eventual over-hype '03 turned out to be.